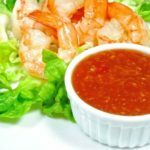 And you thought you knew everything about cocktail Sauce! 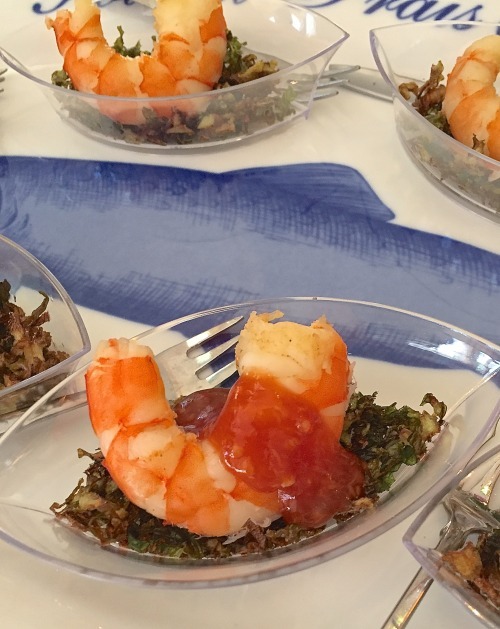 Six shrimp teetering on the edge of a glass filled with cocktail sauce is not my idea of shrimp cocktail. 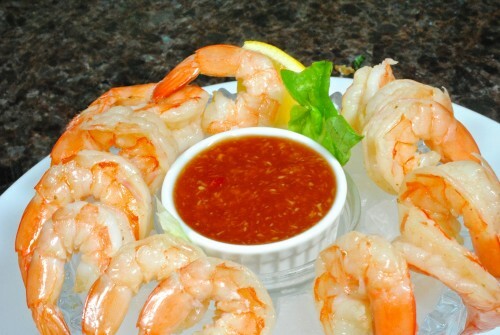 I want a lot of shrimp because that is probably all I’m going to be eating other than something to dip them in. This recipe is from Rick Souders and I happened upon his site looking for food photography. If you have a minute, look around his website and he also has two blogs which have some beautiful recipes. 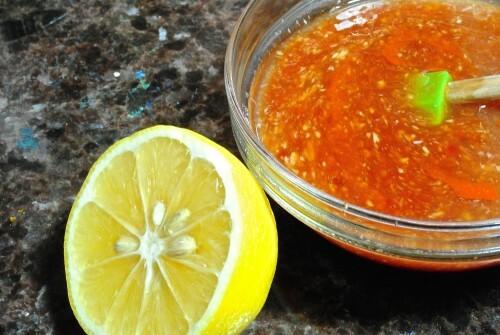 Normally when I make a cocktail sauce, nothing gets measured; goes something like this — bowl of ketchup, horseradish, lemon juice, Worcestershire sauce and a little hot sauce, stir it up and serve. I though Rick’s recipe sounded interesting because of the sweet chili sauce (which I use all the time in other things) and also the balsamic ketchup which I just happened to find at the grocery. The ketchup was about $5 a bottle and if I had not found that I was going to add a tablespoon of balsamic to regular ketchup. So, you know what you can do now if you don’t want to spend the money or cannot find the balsamic ketchup. I thought two pounds of shrimp would be more than enough for just the two of us and decided to get it cooked and chilled the night before going into surgery so when we got home all I had to do was prop up the foot and wait until dinner time. After eating dinner that night I decided to make some changes. My husband loved it but said it was thiner than normal cocktail sauce. So I decided to change the recipe and add zest of one lemon and only use 1 tablespoon of lemon juice. I loved the taste the Thai sweet chili sauce gave the cocktail sauce. I also used this sauce for a little amuse bouche I did the other day for a luncheon. Hope you enjoy the pictures. They were so cute. See pictures below the recipe. I found these little plastic boats at Ace Mart (restaurant supply) and I think they were like $3-4 for 10 reusable boats. 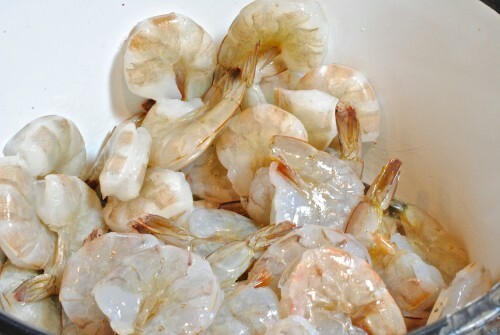 I plan on making a shrimp or lobster salad and serving these little boats with some crackers on the side. This was 26-30 count shrimp. Shells on but deveined. 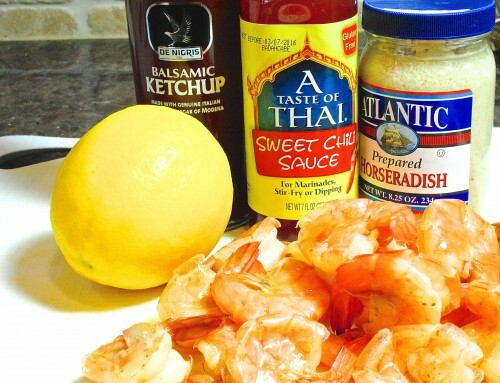 If you can’t find the balsamic ketchup, just add 1 tablespoon good balsamic to regular ketchup. 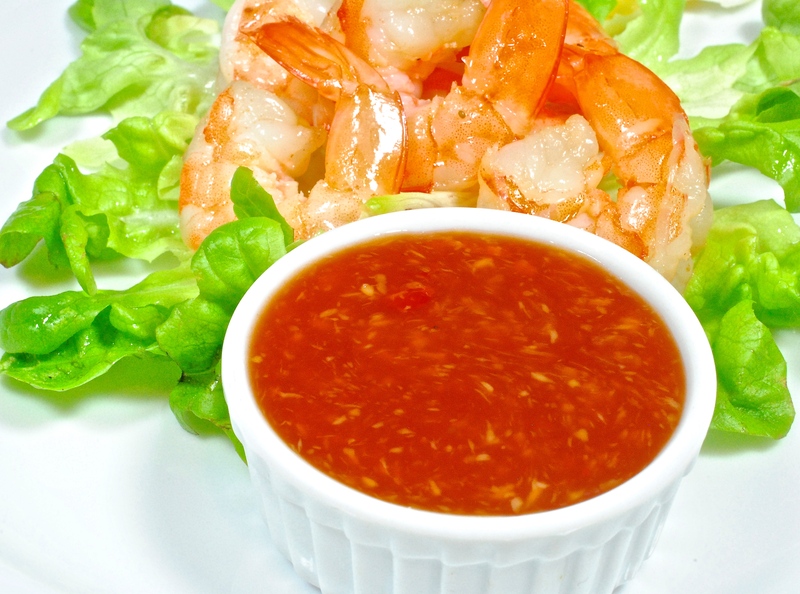 Mix the balsamic ketchup and Thai sweet chili sauce together and hot sauce to taste. 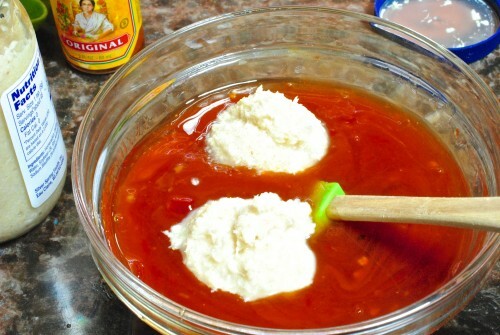 Add in the two tablespoons horseradish to the ketchup and chili sauce. Add in the two tablespoons of lemon juice or do as I suggested about and do the zest and juice of just one lemon. You can either serve the shrimp on a bed of lettuce of around a crushed ice filled bowl with sauce in the middle. 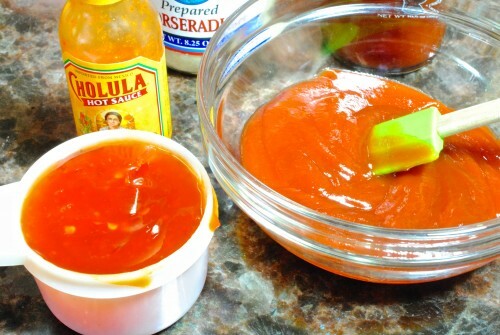 I could not get enough of this sauce. It is so good. add salt and pepper and hot pepper sauce to taste if needed. Note: If you cannot find the balsamic ketchup, add 1 tablespoon balsamic to regular ketchup. 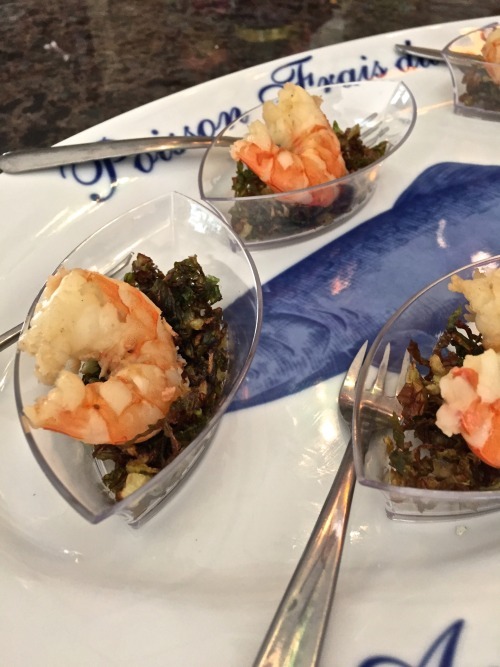 A little seaweed (or fried lettuce), shrimp, then top with cocktail sauce. 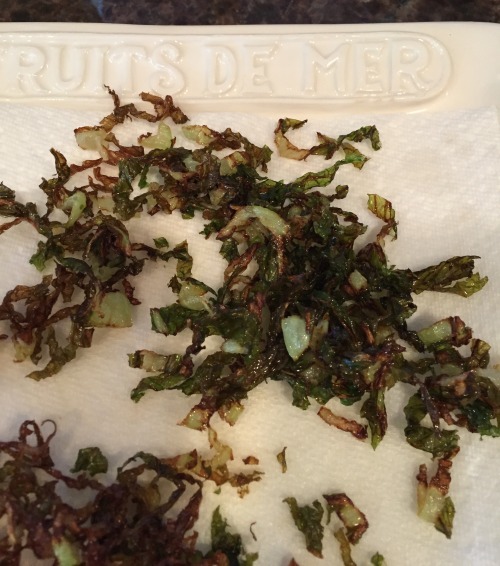 Finely shred some romaine lettuce and fry in hot oil, drain on paper towel then use as a garnish. The greener your romaine leaves the greener your seaweed will be.